Blunder #1: Getting lost in their own work. Drive sabotages inexperienced leaders when they go into heads-down mode. Leaders often have work responsibilities beyond leadership. Their job includes being part of the team as well as leading the team. Inexperienced leaders lose sight of others and the big picture. Reality sneaks up and smacks them later. Adopt a morning ritual that includes greeting everyone in the morning. You came in early and went right to work and forgot to connect. Schedule connection time like lunch or coffee. Go on a gratitude walk in the afternoon. Blunder #2: Minimizing the difficulty of doing things they haven’t done. There’s almost always more to a job than you think, especially when you’ve never done it before. When you minimize difficulties, you offend those who are actually doing it. Never minimize. Ask experienced team members to explain what it takes to get the job done. Become accountable to an experienced leader. Blunder #3: Not asking for help. 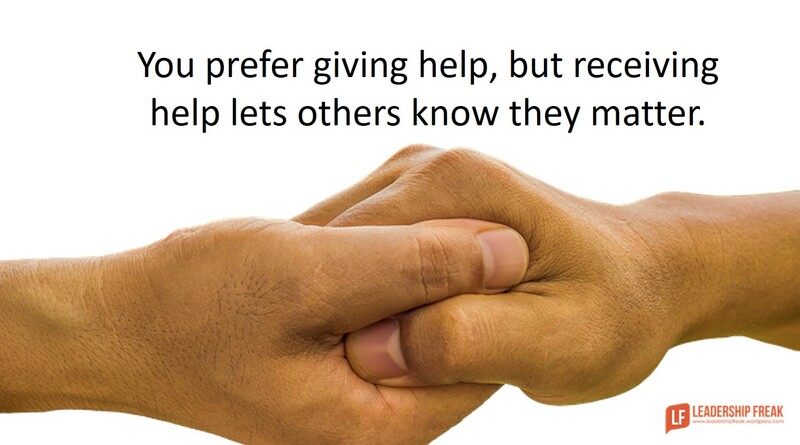 You prefer giving help, but receiving help lets others know they matter. Self-confidence and trust are key factors in asking for help. Blunder #4: Getting stuck in negative patterns. Pattern recognition is a skill of experienced leaders that requires insight, input, and reflection. Quickly moving from one project to the next – without input and reflection – almost always produces self-defeating patterns. You wrongly think you understand the causes of success or failure. Perform after action reviews. What worked? What didn’t? Why? Blunder #5: Feeling picked on and misunderstood. The reason people don’t know you is you close them out. It’s safer to remain distant, but the consequences often short-circuit success. Leave a little of yourself in conversations. Talk about intentions and aspirations, for example. What blunders do inexperienced leaders fall into? How might inexperienced leaders avoid common blunders? In my opinion, blunder #3 is the worst one – one a leader forgets about his/her own humanness, that’s a recipe for disaster… and for a toxic workplace. Thanks Andrea. We start our careers with a ‘giving help’ mindset. It’s one of the things that helps us get ahead. It can be very tough to shift modes. Leaders who can’t ask for help end up overwhelmed and frustrated. Often they complain about the people around them. I wish Blunder #1 would have come out next week instead of this week. I am under-staffed and focused on the mountain of tasks that I must get done today (will be working 16 hours, if not more). This bullet point really kicks my rear this morning, haha. Thanks. Thanks George. I respect your transparency. Let’s face it. Sometimes we have to put our heads down and plow forward. Don’t be too hard on yourself. Perhaps the problem occurs when one period of heads-down work turns into another and then another. Best wishes for a successful week! VERY Excellent post. We promote good workers to being supervisors and DDI data suggests that 13% then actually get training. Good working results are not equal to good management results. FREE The Supervisor – remove some of the measurements and tasks and allow them to focus on doing the things you suggest. Data suggests what we do is bury them with reports and meetings. Thanks Dr. Scott. Sadly, many first time managers are set up for failure. They hang on to their jobs and are given new responsibilities. Organizations take advantage of some of their best people. They burn them out and then criticize them. My first response to meet everyone at the start of the day was “I have assistants that do that”. I need to fix that thanks. Fantastic piece right there! Point 4 resonates quite well with me. It’s really tough overseeing many unrelated at the same time. More so when you have to work with one key but inefficient subordinate, and a cocky and bullying boss. Thinking (1) they are above others (2) they may not have to work so hard, they think they have made it, so to speak (3) unable to find the correct balance for delegation (4) they may possibly forget they are a team member as well as a leader (5) arrogance (6) closed door (7) develop favourites (8) tunnel vision (9) incorrectly thinking they can handle ‘leadership’. Blunder #6: Failing to have confidence in your folks to get the job done resulting in micromanaging and driving your folks NUTS! Great article Dan! Great leaders recognize that there can be zero innovation without vulnerability. They have the self-awareness to understand and talk about their vulnerabilities and seek help. This inturn builds trust within their team.